Patrick Jacques Roy, a 4-time Cup winner and record 3-time Conn Smythe playoff MVP, is arguably the greatest goaltender in NHL history. Roy was also a crazy sonofabitch. He refused to skate on the blue lines of the ice, wouldn't talk to reporters on game days, and regularly consulted with his goalposts during games. He was even arrested in 2000 for domestic violence, where the insane Quebecois netminder destroyed the inside of his house and allegedly ripped a door clean off its hinges after his ex-wife, Michele, locked herself in a room. It comes as no big surprise then, that Roy was a scrappy fella who had no fear of dropping the gloves. In today's NHL entire team-on-team fights have become an increasingly rare spectacle, and goalie-on-goalie fights even more so. This is why today, we pay homage to Patrick Roy not for outstanding performance between the pipes, but for his willingness to contribute his fists not once, but twice, to the Red Wings - Avalanche rivalry. In March of 2008, Roy's son Jonathan, then a goaltender for Patrick's Quebec Remparts QMJHL team, skated the length of the rink and started beating on the opposing goaltender, Bobby Nadeau, who was clearly not looking to fight. The Remparts had been losing 7-1 in the second period, and Coach Patrick pretty obviously signaled to his goalie-offspring to bring da ruckus. In 2008, Jonathan was charged with assault in a Quebec court. In November of the same year, Roy's other son, Frederick, was playing forward for his dad's Remparts when he cross-checked an opposing player in the head. After the whistle was blown on the play. Freddy was suspended for 15 games by the league. 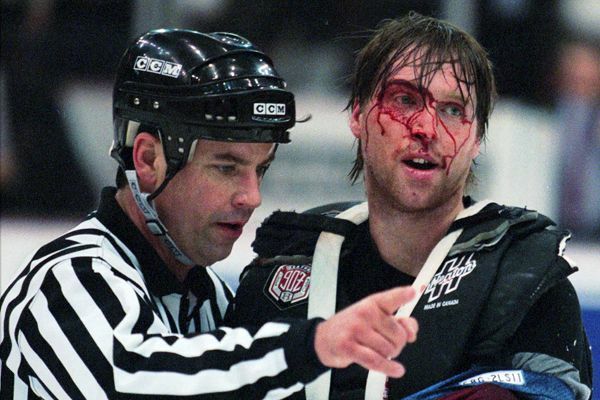 Now, Patrick Roy's intensity and closely-related insanity helped him succeed. He thrived under the pressure, the spotlight, and the naysayers. He can even be credited with the best comeback in the NHL in response to Jeremy Roenick mouthing off. However, while Frederick and Jonathan are both angry fellas, neither is really all that good. At all. Here are Jonathan Roy's goaltending stats over his two legitimate seasons with the Remparts: 22 games played in 2007-08 with a 3.76 GAA and .872 save percentage. In 2008-09, he played 68 games with a 15-5-1 record, yet sported a 3.04 GAA and .897 percentage. As for Frederick, in his one real season with the Remparts in 2008-09, he put up 7 goals and 17 assists in 50 games. Yet both of them have proven to be thugs, without any prospect of NHL-caliber talent. Bummer for St. Patrick. And I think we can agree that all in all, Michele Roy has had to put up with a pretty ridiculous family.